She did a lovely thing by rescuing her and looking after her so well she lived a long and happy life. I know of so many people just lately who have lost their cats, one of my brothers included but they have all been very old which shows they were well cared for. Little puss cat is all peaceful now. The vet said that he was amazed that she lasted this long, the swelling under her tongue must have made eating very painful. Our daughter was very tearful when I spoke to her last night and this morning. By the time they came round to us for breakfast, she was feeling a bit better. Normally when our little one gets home the first thing she does is look for the puss. She didn't do that today and hasn't asked about her yet! 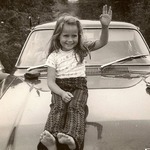 VW, you are right about children. Kids get over pet loss easier than we do. Though as upset goes, they do go straight up to high doh immediately. So sad to read about this and hope you and your family have many special memories and feel blessed to have had such a wonderful time with her. Does anyone want a smile? This was the conversation this morning between our daughter and three year old granddaughter. I miss Piper, is she going to stay at the vets forever? Yes darling, Piper was very poorly and couldn't stay with us any more. If the vet has taken our Piper, he should let us have one of his. Now to work on daddy. Awww, Trisha I know that was meant to make us smile but I felt a bit tearful...the innocence of children eh. Ah, how sweet! It made me smile but sad too because of the circumstance. Yesterday, she was playing at going to the vet. She brought her fluffy's to me to be looked at. 'Granny vet' it's only play, you can't keep them. We asked if she wanted to make some pictures for Piper, 'not today granny'. She doesn't mention the puss cat all the time, but she is obviously thinking about her. Does she know Piper isn't coming back Trisha? It's very difficult conveying this to children as they can't grasp the meaning of death. Pet's are a good way of helping children learn all sorts of things, kindness, responsibility, consideration and being gentle and of course about loss and grief. Do you think your daughter may get another cat for little one to love? When I was 3 my great aunt died. It was back in the early 60s. She died at home after suffering a stroke and being nursed by family members. I still remember prior to her funeral that she was lying in her coffin with the lid open. It meant nothing to me then, she was still my auntie but I was so very young and clearly did not understand what was happening. I was not afraid, that's for sure. In later life, I was able to see and touch my parents after their passing, the early experience of death taught me that there was nothing to fear. I hope the passing of Piper although so very sad, teaches your little one what I leant. Not to be afraid and that love is all around. B, yes she does know that Piper isn't coming back. We have tried to explain everything without worrying her. We have a book called Grandads Island, it's a lovely way to explain that sometimes people don't come back. We didn't buy this book specially, it was in a selection of books that have been given to us.